Most people don’t understand that a certain amount of stress is necessary for optimal performance. Knowing the right amount for you is one of the five keys to staying highly motivated and engaged. Other strategies include learning how to control overly negative thinking (especially worry), learning how to recover quickly from an emotional episode, and learning how to handle disturbing emotions in yourself, your coworkers and your boss. Once you master the five simple steps outlined in this film, you will be able to get along better with others, handle stress better, communicate better, work more efficiently and be more productive. An internationally respected psychologist, Daniel Goleman pioneered the study of Emotional Intelligence in 1995 with his ground-breaking book, Emotional Intelligence. He continues to teach and lecture on this topic to audiences in business, psychology, and education. IQ is not the only measure of one’s abilities. On the contrary, great leaders have the ability to recognize and manage emotions in themselves and others. These skills include: knowing one’s emotions (self-awareness), managing emotions (self- regulation), recognizing emotions in others (empathy), handling relationships (social skills), and the drive to achieve (motivation). People who are Emotionally Intelligent tend to be better leaders, are more productive, earn more money, communicate better, handle change better, work well as a team, and handle stress better than those who lack these skills. 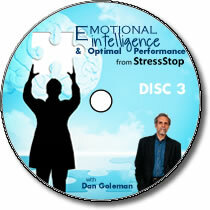 In this third DVD from the Emotional Intelligence Series, Dr. Goleman teaches you you can harness the power of Emotional Intelligence to motivate yourself and others toward optimal performance. The discussion leader then expands upon the concepts using the instruction materials included with the DVD. This complete facilitator kit includes 1 DVD video, PowerPoint slides, leader’s guide, and bonus materials.